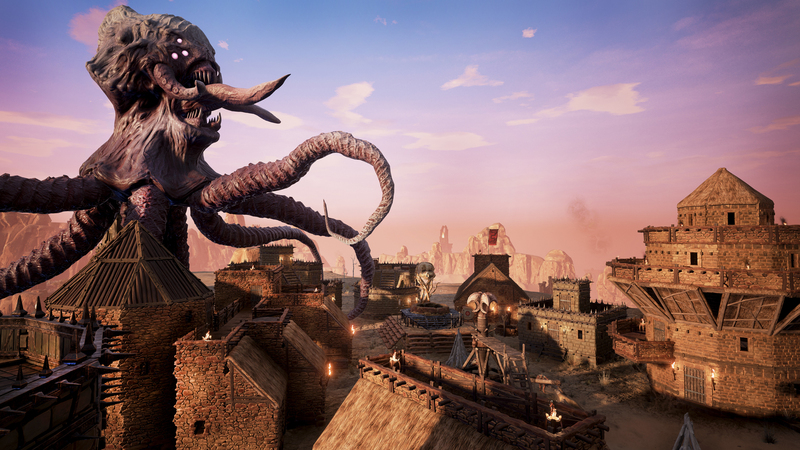 Conan Exiles: a fun game that is hard to play because all the public servers are laggy wastelands (the wrong kind of wastelands). 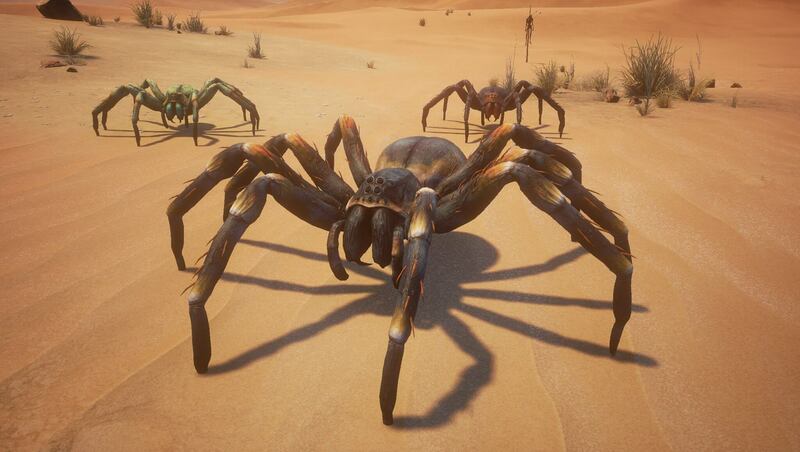 In a pantless world where everything kills you, base building has never been more essential so come and help protect us against the endless swarms of giant spiders and sand imps. Enslave npcs and break them down on the Wheel of Pain so that they will serve as your willing thralls. Hunker down as a brutal sandstorms scour all life from the landscape. Most importantly build shrines to your god and sacrifice your enemies there to acquire enough spiritual essence to summon Cthulu like monsters that can level entire cities and enemy bases in mere minutes. We are on standard vanilla settings with PA/SA admins. That Cthulu monster looks absolutely terrifying. Sign me up! Looks cool. I've not played this one. What is needed software wise to join? Game is fun, looking forward to what the devs add in. Cool ! You beat me too it ! I just launched a server as well, based in Montreal. Currently up 24/7 as of today. Drop all loot except equipment on death. I'm not a huge fan of pvp - is it possible to play this and just do the pve stuff ? I enjoyed my time in Ark, and would like to get into another crafting/building/fighting game. Yep! PVP on/off is a server option. Cool - I ended up buying the game anyway. I'm on the server in the OP, although I didn't see anyone on earlier. I've build myself a small, 2x3, house, and have a fire, bed and storage set up. Next thing it to get an armourer's forge going, and get a new weapon. I've died a few times to the nearby tribes people, so I need to toughen up before I get some revenge. I really like the fact that you slowly build xp while wandering about - it feels like there's no downtime, that you're always edging closer to your next level, even if your just exploring. I hope to see people on later tonight. Is there a clan ? If so, could I get an invite ? I'm M-Vickers on Steam, and Mark in the game, I'm not sure how the game ID's people. I wasn't playing much Conan due to not wanting to burn out playing solo and wanting to do more coop. But is my body ready for another 1000 hours of it? Yes, yes I think it is. I'll have to check out these servers and buddy up with someone/just run errands for people while I explore. Given how much I enjoyed Ark i'll probably play this at some point. I think i'll wait until there's a bit more added to it though. Ha falling back into my old, and bad, habits of staying up way to long to play. Set up an altar to Yog on a little cliff across from a village full of sacrifices. I'll gladly tear it down and join others though once a base is established. Cool ! You beat me too it ! I just launched a server as well, based in Montreal. Currently up 24/7 as of today. My server is not open to the general public, so if anyone wanted something a bit more casual. Elimination, I had trouble connecting to your server via both direct link and searching for it by name. Said the connection failed or timed out on the former and couldn't find it in the latter. I see what I'm doing all day tomorrow. It works, too ! I used it last night, escaping from crocs on the far side ! I might start gathering a bit further east. A bigger travel time, but probably more efficient that running from crocs every 15 mins. Are mods installed on the main server, or do they install just to the users PC ? Or both ? I've seen a few that would be really useful - like map co-ordinates, increased stack sizes for materials, one that lets you convert wood to sticks and sticks to bark - but nothing game-breaking. Anyone want to team up today? I'm pretty much up for a full day of gathering and building. Plus, I know a sweet spot for a base. Found the problem trying to connect to Elim's server, it's 167.114.117.43:27083 (the 4 should have been a 3) but there is also no password protection atm. Edit: Thanks to Malakaius for pointing this out. Edit 2: but then when I try to see it on Steam servers I have to use 167.114.117.43:27084...I'm confused, but at least I'm on. Are folks gonna try and gravitate toward one server or the other? I ask only because I'd like to follow the majority and not grind levels on a server that no one will be playing on. Currently I'm on the OP server. I imagine more people are going to gravitate towards the OP server for the full experience. I've spent so much time playing vanilla ARK I'm fine with going with the more casual server Elim has set up. Moth, acolyte of Set, has set up her Sepulcher in the southeast near the bend in the river on a small cliff across from a village brimming with sacrifices. If anyone else is playing on Elim's server and wants to team up or has a base they'd like someone to buddy up with I'm all game. I'm more of an explorer/fighter than a builder so if you want someone who isn't afraid to haul back supplies and craft your armor/weapons I'll be happy to help. I'm on the OP server, too, there's a few of us there. I'll probably end up keeping a character on both servers since I primarily want to co-op in this game. We've got a decent presence going on the OP. Could use 1 or 2 more in the clan though. I have been peer-pressured into getting this. Jumped on the OP's server and built a little hut by the river. Also died like a dozen times. Now how do I get slaves interns? Take Thrall Taker at level 10? It'll give you all the blueprints for making your own interns: Truncheon, Bindings and Lesser Wheel of Pain. Some of the crafting items require other refined material like leather and iron ingots so may want to hold off unless you have a buddy taking care of those. Build the Lesser Wheel (somewhat expensive but worth it) and make some gruel (campfire: seeds/nuts + fiber) then go find your future intern. Use the truncheon to knock them out, equip the bindings to carry them to the wheel of pain, "turn on" the wheel of plain with having plenty of gruel and wait it out. Can be sped up if you convert a taskmaster into a thrall to manage your wheel. Only one thrall can be made per lesser wheel. Also be careful about dragging your thralls long distances with the bindings, they'll wake up and attack you again but you can knock them out again as well. Once they are converted you can have them enhance crafting stations where appropriate (a cook can work a campfire, not a smelter) or deploy them like structures (do this for fighters). Be aware they weigh 50 units each though. Keeps you from going to a neighbor and deploying a thrall army. I'll see if I can get someone to help me with the materials for those buildings. I'd like them to start climbing the corporate ladder asap. Kinda cracks me up having a mumble server when discord is right there. Oh well your server your rules. Yeah, I checked out the wall and setting it up on the easiest path to iron is a real deal breaker for me. I'll just enjoy casual mode on Elim's server. The camp I'm by has a Smelter thrall and I've seen cooker thralls scattered in other groups. Probably better pickings at the larger camps/villages. I usually can tell them apart by their gear, smelter looks the part and cooker is usually wielding a hammer. Yeah the other thrall types can be found at the larger camps. And whoever set us this wall wasn't very clever. I was able to jump over it with no issues and the didn't block the other path like 10 yards to the east so it isn't actually stopping anyone. In the mean time I started construction of what will eventually be a supply depot in the eastern entry but for now is preventing anyone blocking that path off. Also that's griefing and knowing the admin it will be coming down soon. I figure, I'm Evidar ingame so I was part of that discussion. 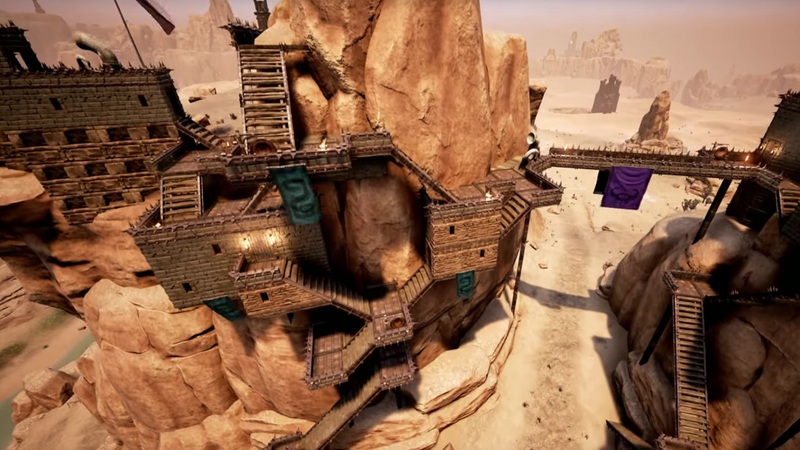 I'll be on for an hour or two later, I have an idea for the fort later that should stop our thralls running off and make them better defenders too. For the rest of you, be advised we have a solid admin and the makings of a good clan. The server is getting a decent amount of use too, so there will actually be some competition l. I highly recommend that you join us. I'm a few levels from starting capturing thrills (all my levels went of house stuff) but I have a pile of seeds, so can start stockpiling gruel, as long as it doesn't spoil. Also, how does the clan work ? Can everyone access everyone's home and stuff ? Or can you mark boxes, etc, as clan-only ?